‘Whitefield phase BMRCL gets over 44 acres from central ministry,’ said a recent headline in the Economic Times. The news report said that the state Revenue Department had agreed to hand over 16 acres of land in Thippagondanahalli and another 30 acres from six villages in Kali Tiger Reserve forest, to the Forest Department. The land transfer was on behalf of the Bangalore Metro Rail Corporation Limited (BMRCL). With this, the “hurdle” that delayed BMRCL from acquiring forest land was cleared, making way for Metro construction in Whitefield. What was the “hurdle”? BMRCL had identified 45.18 acres of forest land in Kadugodi to construct the Whitefield depot under phase II of Metro. But BMRCL needed land elsewhere, as it is compulsory for state agencies to make up for tree loss for public projects by planting new trees. BMRCL had got 29 acres of land near Dandeli Kali Tiger Reserve for afforestation, and needed another 16 acres. By providing 16 acres near Thippagondanahalli, the state government cleared the “hurdle” for BMRCL to go ahead with Metro depot construction. Now, the trees lost at Whitefield in Bengaluru will be compensated by saplings planted at Tippagondanahalli, 40 km away from the city, and at Dandeli in Uttara Kannada district, about 500 km away. 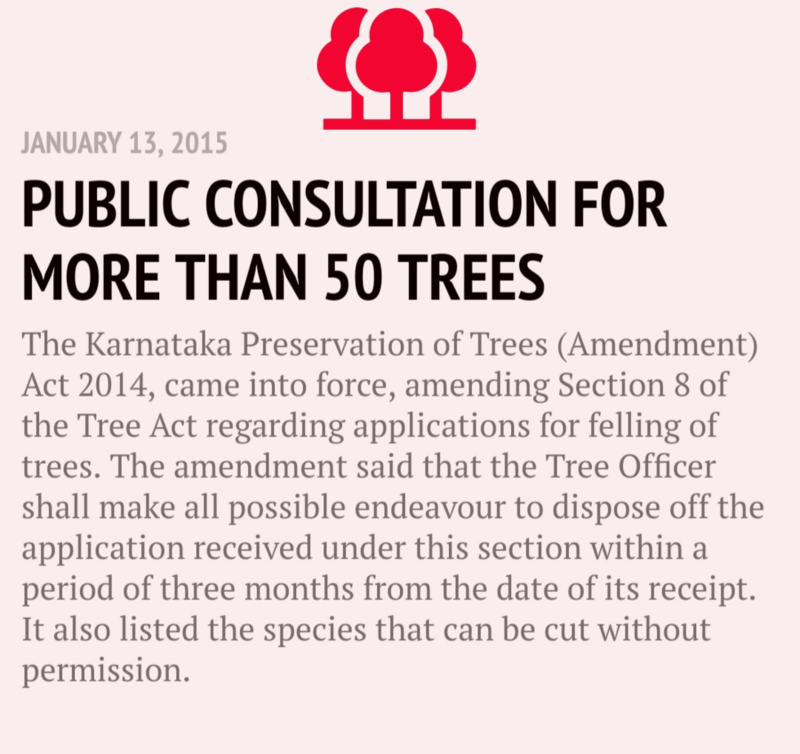 Afforestation will take place at the rate of 10 trees for one tree cut. Does it make sense to plant compensatory trees someplace distant? Where are the trees planted? Who keeps track of how many trees were planted and how many survived? 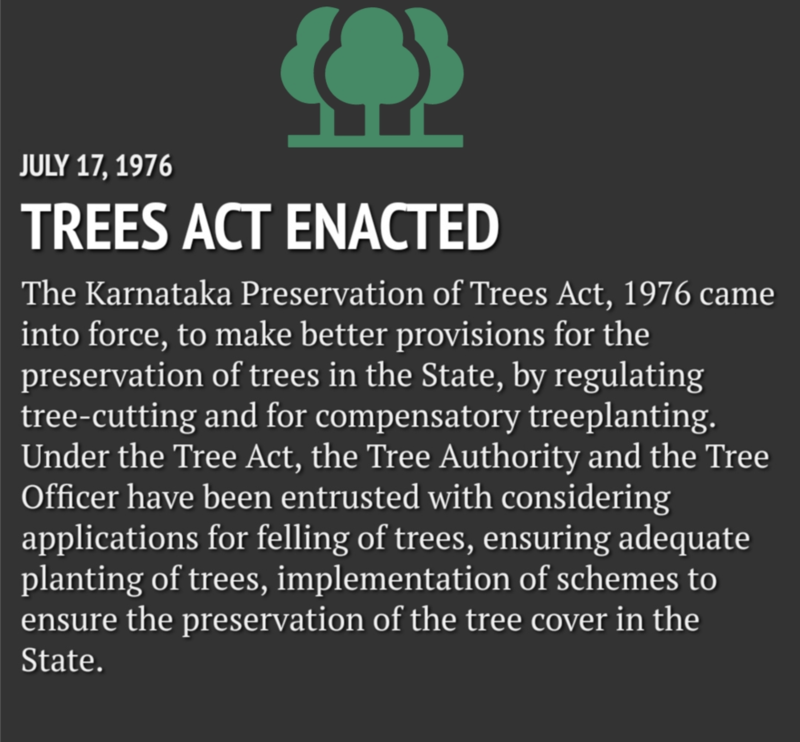 Why aren’t laws for afforestation helping? Does it make sense to plant a tree elsewhere? “No,” says Harini Nagendra, an environmental expert associated with Azim Premji University. “It compensates in terms of the number of trees. But the people who benefit from those trees are not the ones who lose the trees. 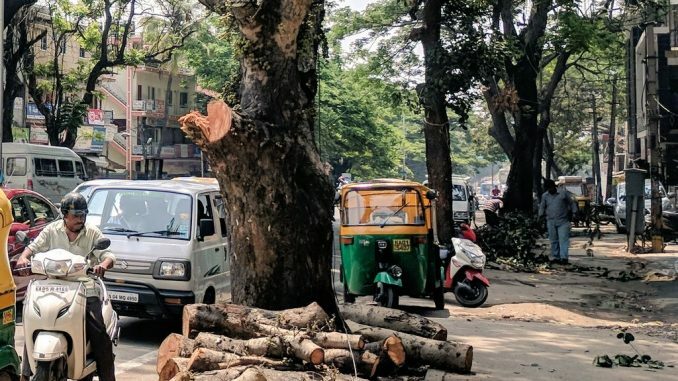 Let’s say if you cut trees in Kanakapura Road but your compensatory plantation is somewhere outside the city, how is it going to help people who use the roads where the trees were cut?” she questions. “Compensatory plantation is done somewhere else as there is no place within the city. The roads where they cut trees, can’t accommodate new trees,” she explains. Harini thinks there may be land within the city if officials look closely, in some park or roadside; but officials say there is no land, and plant trees elsewhere. 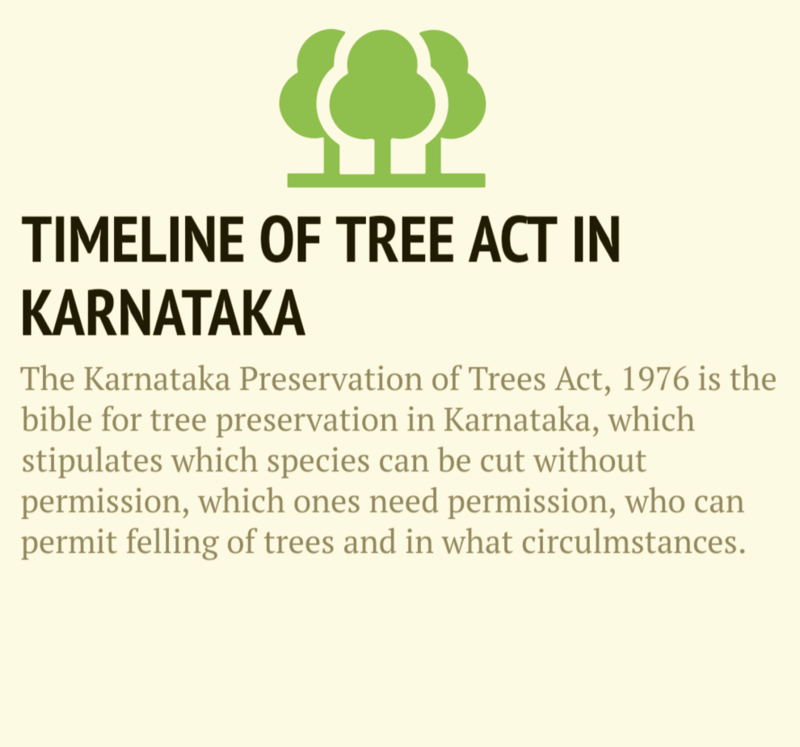 Planting trees elsewhere is allowed, as per an amendment made in 1987 to the Karnataka Tree Preservation Act (TPA), 1976. 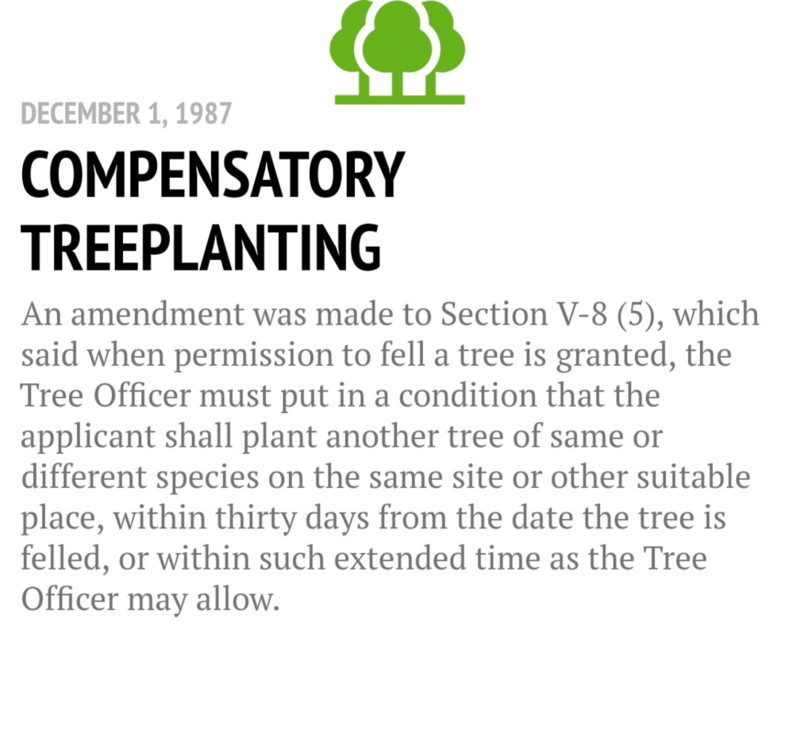 As per the amendment to Section V-8 (5) of the Act, when the Tree Officer grants permission to axe a tree, he must put in a condition that the applicant shall plant another tree of the same or different species on the same site or other suitable place. The new trees can be planted within 30 days from the date of tree felling, or within such extended time as the Tree Officer may allow. 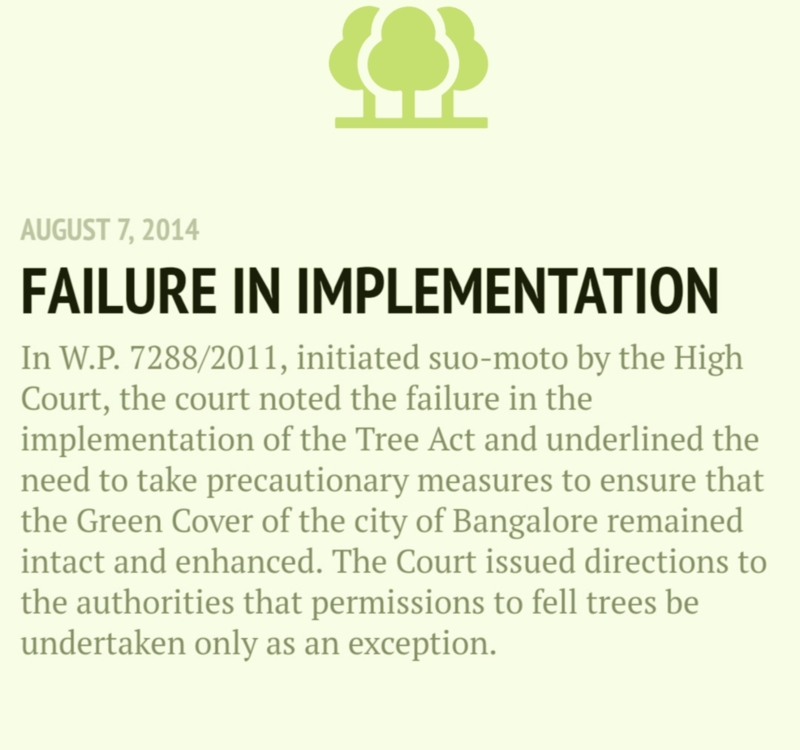 Within BBMP limits, the Tree Officer from BBMP’s Forest Cell is responsible for giving permissions for tree felling. 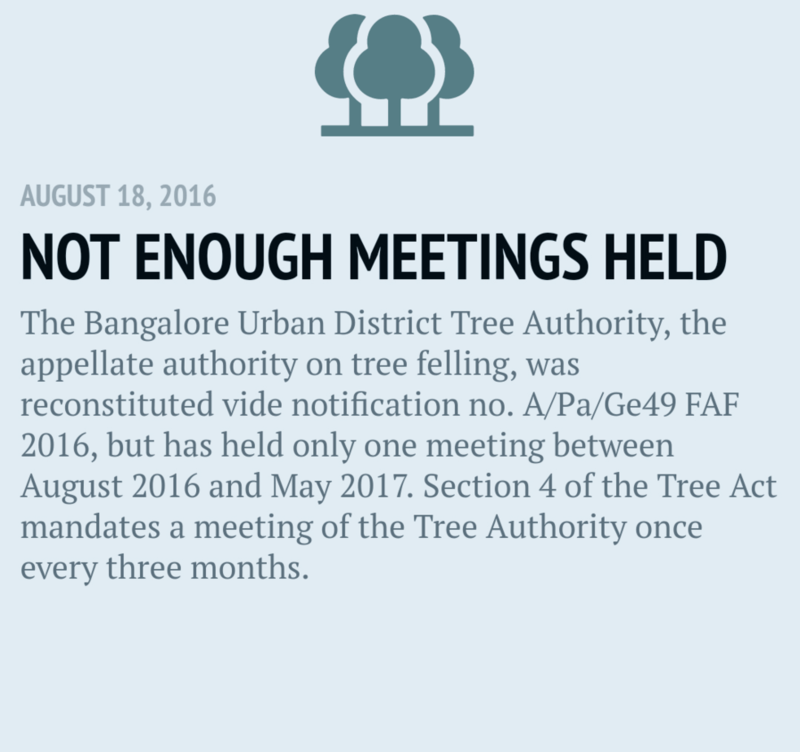 Appeals against the decision of Tree Officer can filed at the Bangalore Urban District Tree Authority. The latter is also responsible for carrying out census of trees, maintaining trees as per standards and so on, as per the Act. However, the Act does not hold the applicant or Tree Officer accountable for ensuring that the compensatory saplings eventually get planted. It does not mention any punitive action against officials who fail to conduct their duties either. Thus, when officials say ‘compensatory afforestation’, there is no geographical limit or clear time limit for it – afforestation can be undertaken anywhere and anytime. 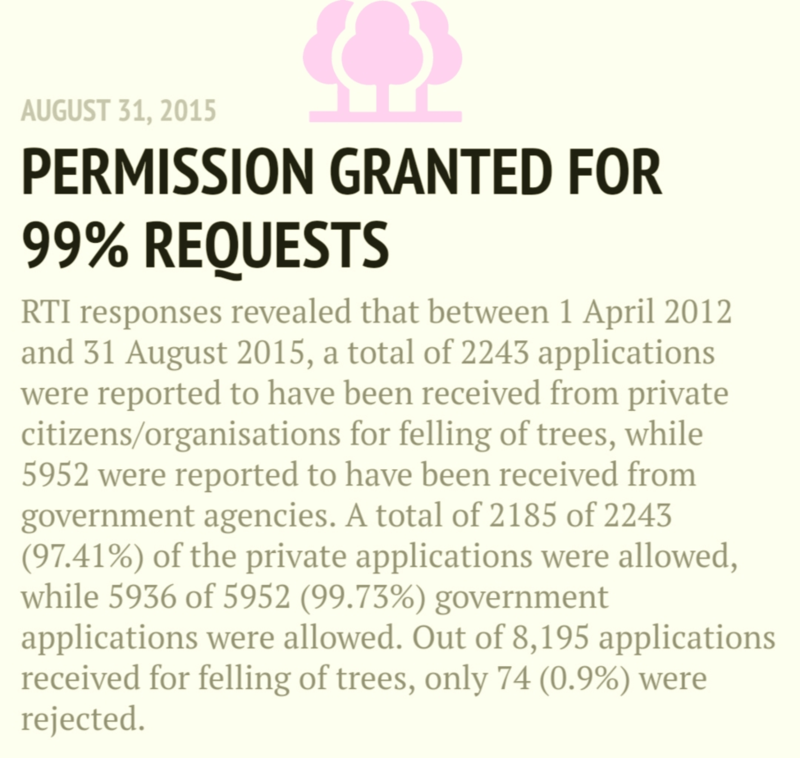 There is no robust mechanism for the Tree Officer or other authorities to keep tabs on afforestation either. Where are new trees planted? Harini says that wherever BMRCL itself has planted trees – along some Metro rail stretches like in Jayanagar, and some outskirt areas of Bengaluru – they have done a good job, and the trees are doing well. But BMRCL also outsources compensatory planting to other departments like the State Forest Department. Forest department further outsources it to contractors. This creates confusion as nobody keeps track of the saplings planted or their survival. “We don’t know who plants the trees – BBMP, BDA or Metro – and whether they count the trees. They are also not sure about the trees planted by them,” says Harini, explaining the way compensatory trees are vaguely designated in ledgers, making it impossible to track specific trees. Harini was a member of the Tree Committee formed in 2016 to reduce the number of trees to be cut by BMRCL, but resigned from the committee as she didn’t find BBMP responsive to suggestions. 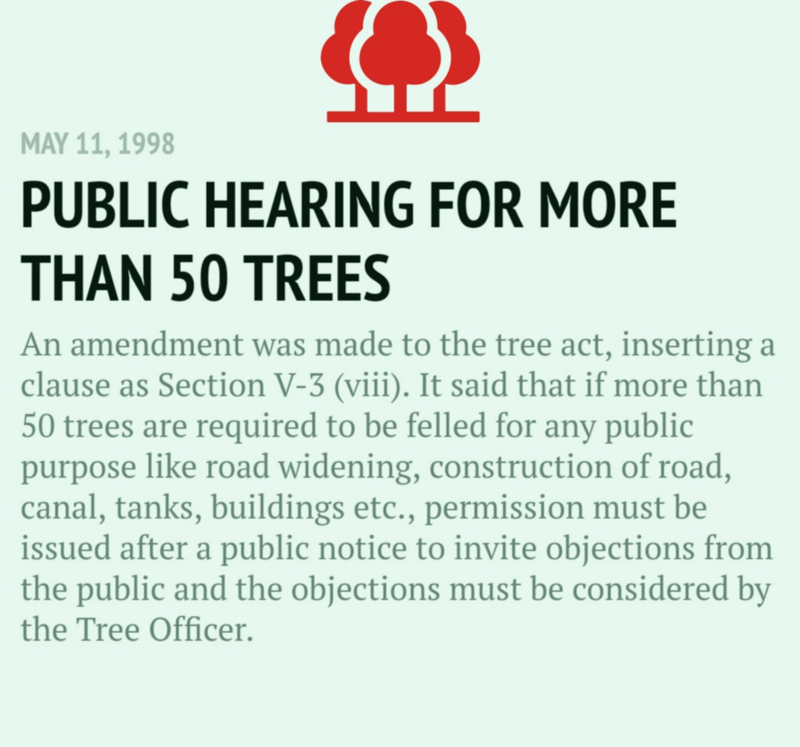 The committee had suggested publicising details of trees felling, geotagging certain trees that were proposed to be transplanted, and so on. “They [BMRCL] say so many trees have been planted on Sarjapur Road, but where are they on Sarjapur Road? And they should be able to keep track of trees easily; it is as simple as taking a photo and mentioning the mains and crosses,” she says. At the time of writing this article, BMRCL had not responded to our questions. The article will be updated when BMRCL responds. While there are problems with compensatory afforestation, tree felling itself is done secretively, without public knowledge. 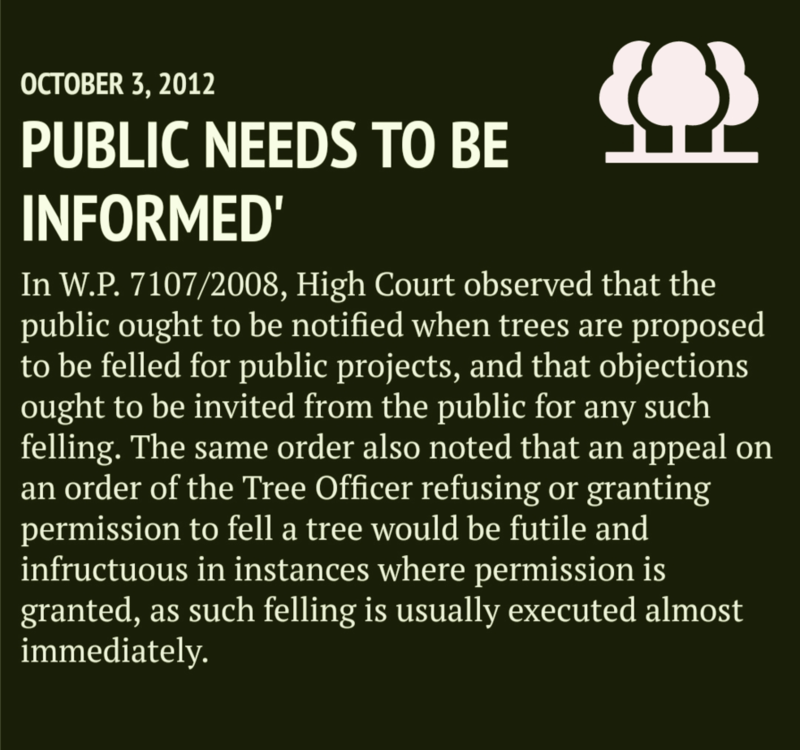 In the next part of this series, we look at how authorities have been avoiding legally-mandated public consultations on tree felling. A quick guide on planting trees in your backyard or in your neighbourhood. On the map, one can see Kadugodi’s Sai Garden apartment complex right next to the path of a natural drain. The apartment is prone to flooding and residents need a quick and sustainable solution. 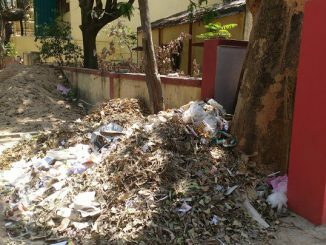 With elections round the corner, Modi’s nationwide cleanliness campaign seems to be failing miserably in Bengaluru. What can citizens do to reclaim their clean and green spaces? NGOs like Say Trees and Trees4Free are atoning for the sins of BMRCL. Just Planting saplings doesn’t get the green cover back to bangalore. It need to be nurtured over years so that it will sustain at extreme conditions like water logging, scorching summer. I hardly see any people water the plants near to their home or offices. What kind of civilization is this? We think economy, technology is more important than life giving trees. What is the real benefit of metro and how long does it help with exponential growth of Bangalore population. All tree lovers, let’s get together for protest. Plant one tree in front of your house and ensure that you take care of it and not bbmp. Today on many streets hardly we get to see one or two trees but lot of cars parked. If the roads are narrow (say for example 2 lanes) and lined with trees, we need to think for the long-term. We should not get a little bit of land on either side of the road and destroy the trees and make it 4 lanes with no trees. If we are going to do it, then plan properly to have 8 lanes (or whatever is the long-term plan), with space for trees, footpath, cycling lanes etc. even if we are only going to lay 4 lanes in the short term – so that there is space for expansion and the trees can be co-located next to the new roads. I have a request. Kindly consider planting shade giving trees in place of trees uprooted by gusty monsoon winds. Every monsoon, we have new spots for tree planting getting created in every locality. I request our BBMP and state government to Plant saplings in every road of Bangalore. Then only we can save Bangalore from disastrous climate. Save trees and plant more saplings in entire Bangalore City,there is whole lot of space left in Bangalore city itself to plant trees. While planning Road widening projects officials should include space for trees.